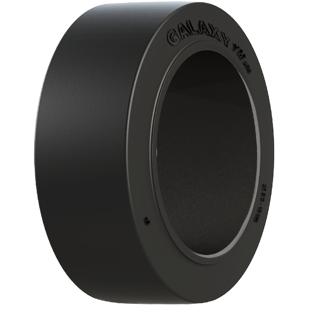 Alliance Tire Americas is launching its new Galaxy YM SDS press-on band tire this week to augment the company’s Severe Duty Solid (SDS) tire line. With 42 SKUs immediately available, the new banded tire rounds out ATG’s material handling offering and makes it easier for forklift owners to quickly replace worn-out tires and get back to work. Built with special, scrub-resistant compound and designed to maximize lateral stability, the YM SDS is available in both smooth and traction tread patterns. YM SDS press-on band tires are available in either smooth or lug pattern in 21 sizes ranging from 10x5x6-1/2 to 28x12x22, covering the range of forklift needs. For more information on new Galaxy YM SDS press-on band tires, the Galaxy SDS line of solid tires, or any of Alliance Tire Americas’ brands, contact your Alliance Tire Americas sales representative, call (800) 343-3276 or visit www.atgtire.com.